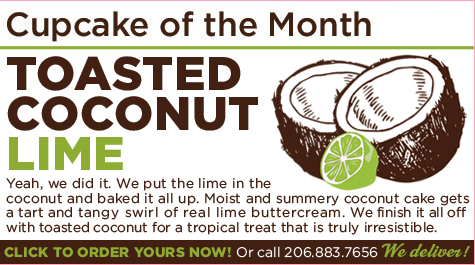 Put the Lime in the Coconut: Cupcake Royale Debuts Toasted Coconut Lime Cupcakes for June! Yeah, we did it. We put the lime in the coconut and baked it all up. Moist coconut cake gets a tart and tangy swirl of real lime buttercream. We finish it off with toasted coconut for a truly tasty tropical treat! 1. If you are giving a speech at your graduation, hide a cupcake under someone's chair. At some point, that person will find the cupcake and begin cheering wildly. Hopefully this happens either during or immediately after your speech. 2. If you are still a little miffed about a certain bad grade, give that instructor a cupcake...better yet, a 2-pack! They won't change your grade, but at least they'll know that deep down, you're really a swell kid after all. 3. If your parents are still speaking to you after all the senseless things you've done and all their money you've spent over the past four years, give them cupcakes. This one really goes without saying, whether you are graduating from college or kindergarten. 4. If you are throwing a graduation party, going to a graduation party, or just like graduation parties, order tons of cupcakes from Cupcake Royale. Literally, TONS. 5. Finally, you're graduating! Give yourself a cupcake already, and congratulations from Cupcake Royale! We believe the children are our future, and we believe those children should eat cupcakes. The Toasted Coconut Lime cupcake will be available for the entire month of June at all four locations; for more information, visit cupcakeroyale.com.